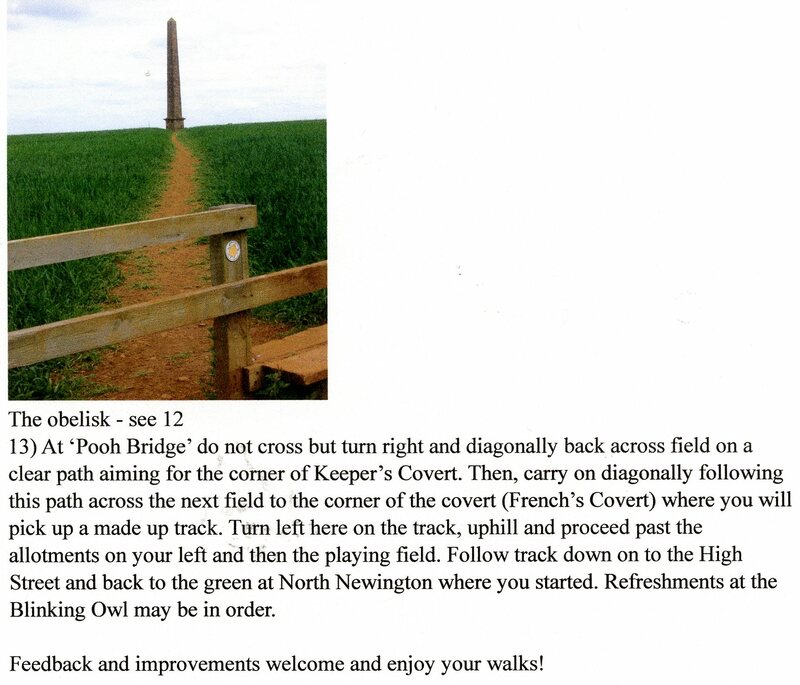 If anyone has any other local walks, please let the editor know and we can put it on the website.. Thanks. There are two walks on this page… enjoy your ramblings. 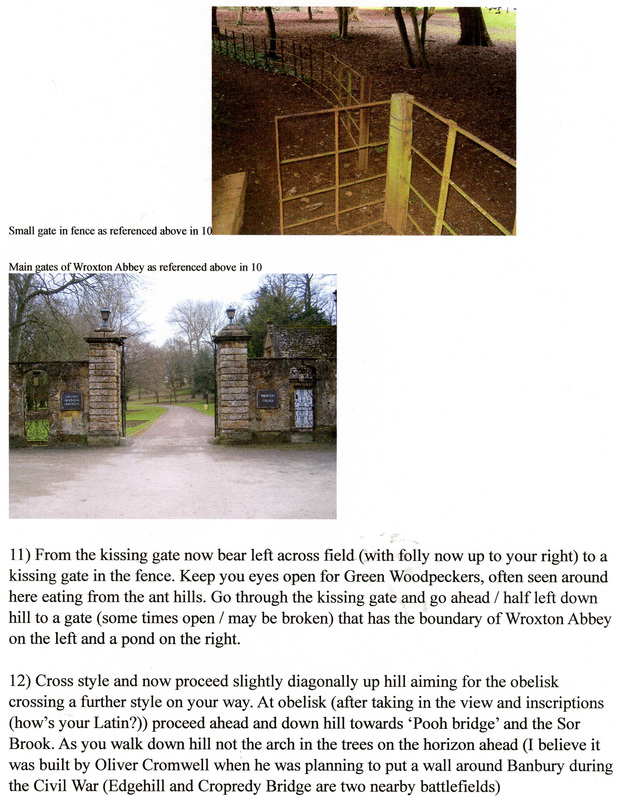 The lovely village of Wroxton near Banbury is the start for so many good walks. Start by the pond in the middle of the village and walk towards the College, continue to the right down Dark lane but look out for a narrow path off to the left. 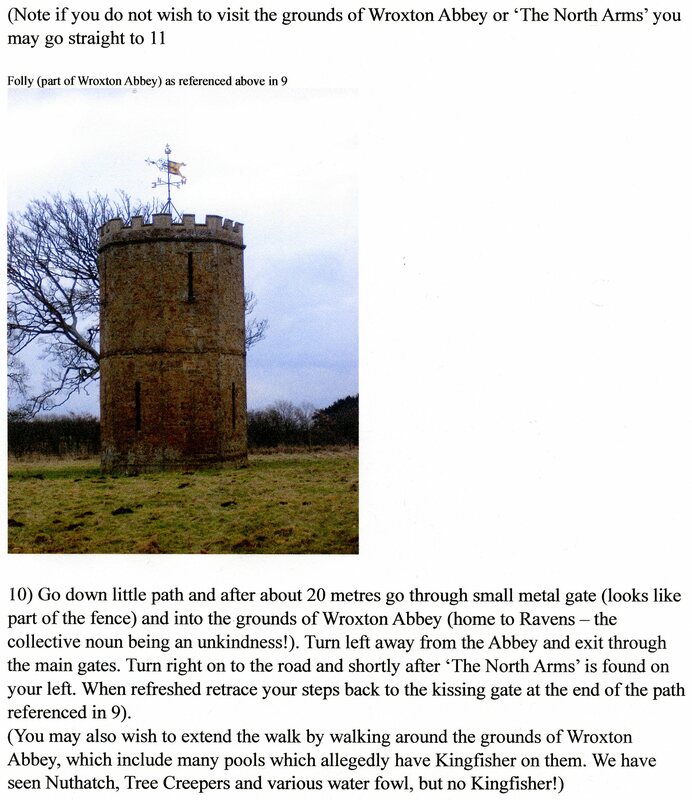 This takes you past Wroxton College, then a path that heads south east past some woodland with small lakes, continue along the path past the obelisk. This path goes around woodland and Newington grounds farm into the village of North Newington. 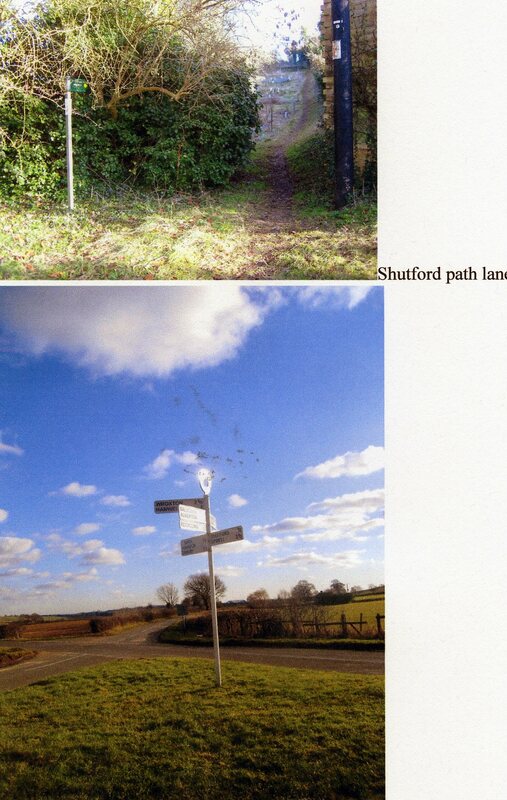 Turn left along the Shutford lane past the last buildings and look out for a path on the left, this joins a lane not far from the castle of Broughton (where part of “Shakespeare in Love” was filmed). Turn right along the lane and then left along a path to Fulling Mill farm. This farm track travels due west crossing the lane to Tadmarton. Keep following the track to Swalcliffe Lea where there is a path off to the right, going almost due north past Upper Lea Farm with Madmarston hill on your left. There was once a large hill fort on top of Madmarston hill. Continue to follow the path just below Jester’s hill where it does a left and right and continues past Round hill to Shutford. 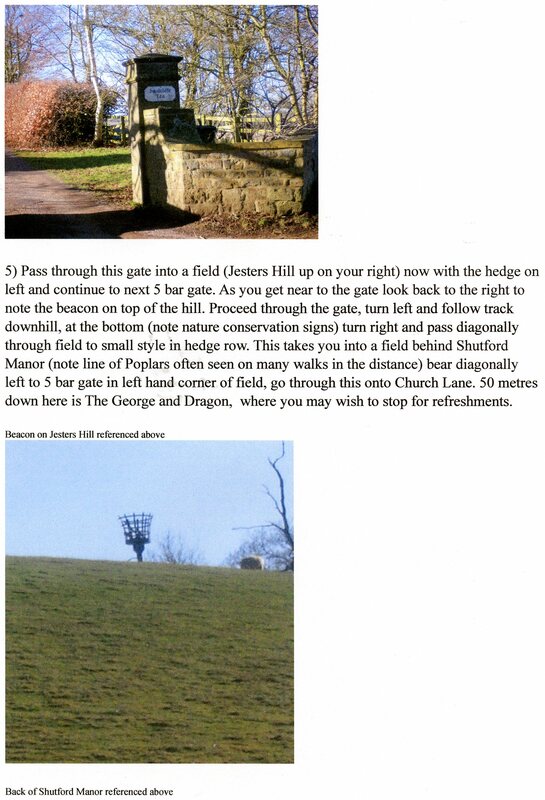 Entry to the village of Shutford. Walking through the beautiful village past the pub and church on your right go straight ahead down Ivy Lane. Ivy lane eventually takes you out of the village and joins the Tadmarton lane, heading north keep right up the hill to Balscote. This is another pretty village built with the local iron stone. Sadly the pub is closed at lunch time and therefore I can’t recommend it. 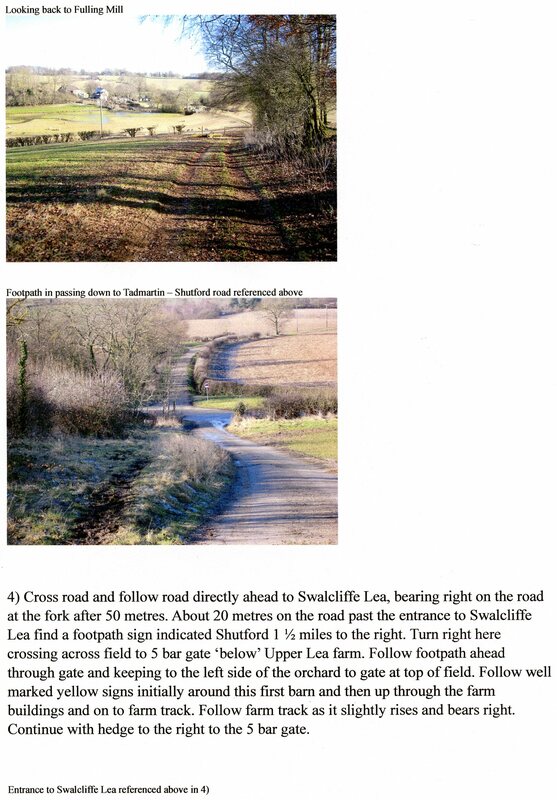 We now turn back east towards Wroxton taking a left and right through the village, take the lane to Manor farm, it turns into a path which joins a lane. Turn left along the lane and look out for a path which according to the map takes you through a disused quarry, but in fact it is busy and very much in use! The path joins the lane to Newington, here you will find a really interesting early sign post. Turn left out on to the main A422 road and almost immediately right back into Wroxton. 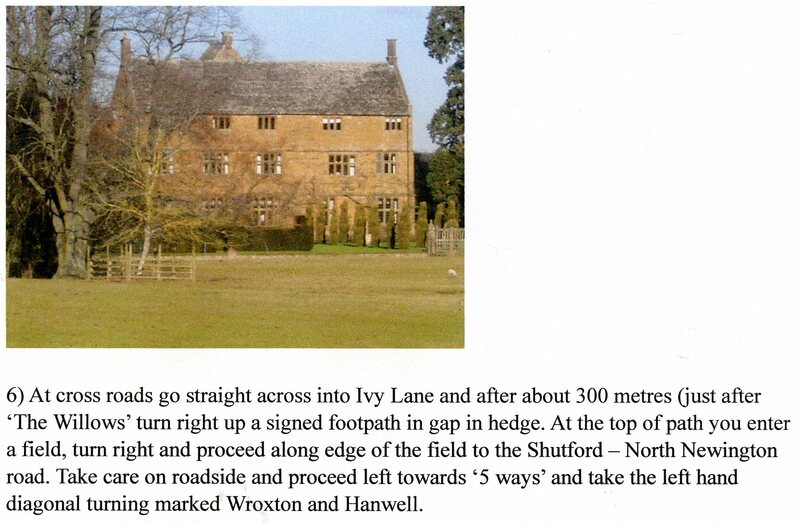 2) PLEASE NOTE… THE NORTH ARMS PUB IN WROXTON IS NOW CLOSED……. Wroxton villagers are trying to buy the pub and re-open it… watch this space. 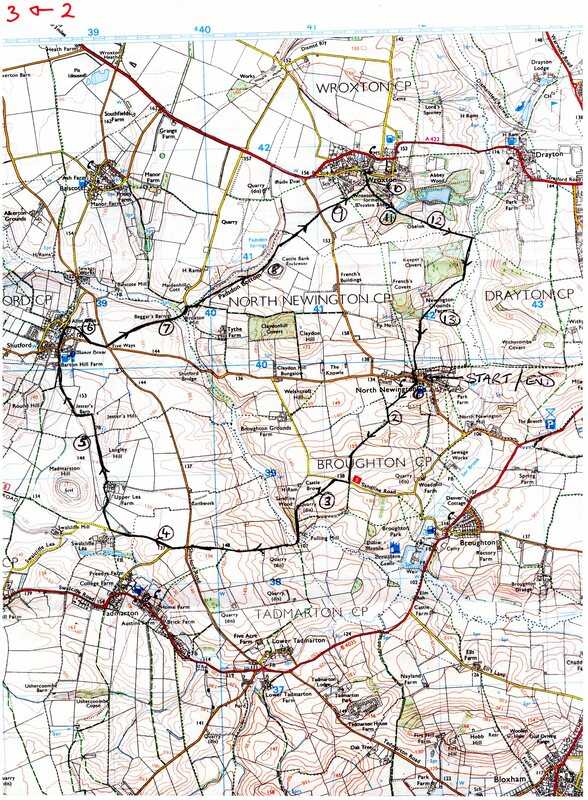 Here is the first new map, with a circular walk indicated on it, with photos too! Some a little out of order, but they are a great help…..
thanks for taking the time to document the route..an interesting walk. thanks for all the effort involved in detailing the walk. We are so lucky we can use so many route from the village without having toget in the car. 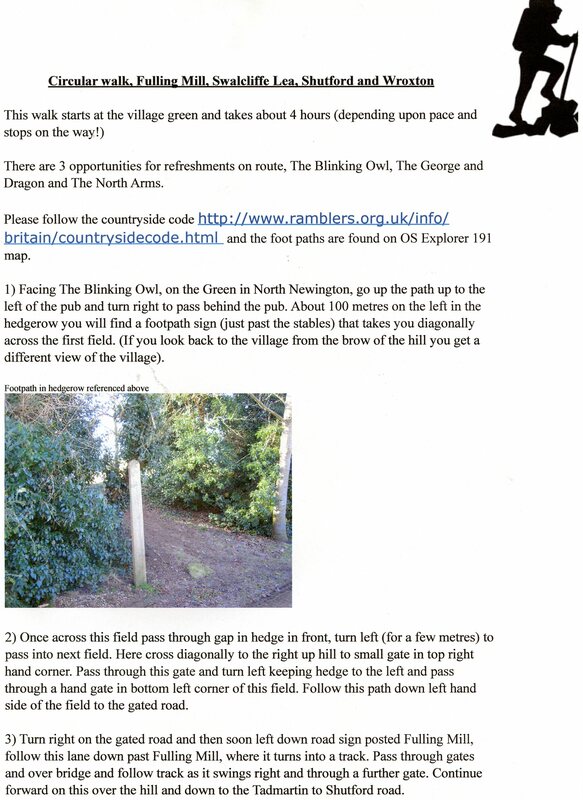 Why not join in the monthly village walk? 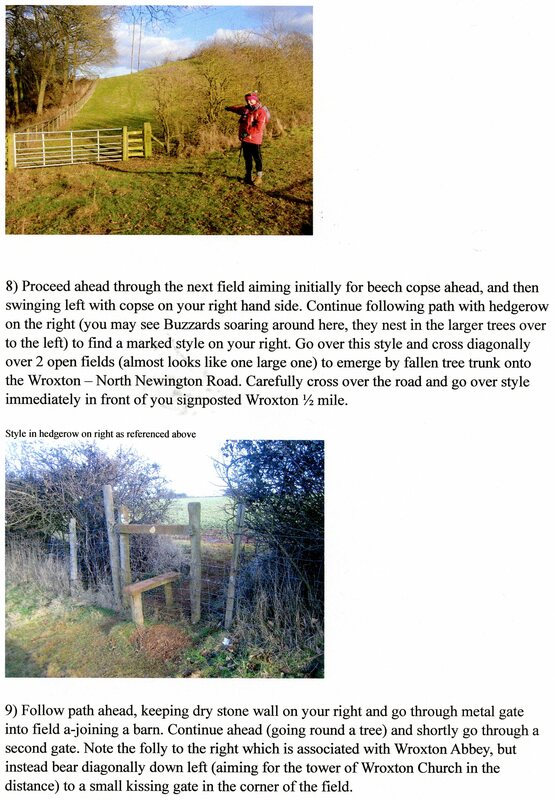 Hi, I am about to try this walk but having printed it off I note there isn’t a number 7. Is it possible you could amend it please? Thanks for putting up the details of the walk. 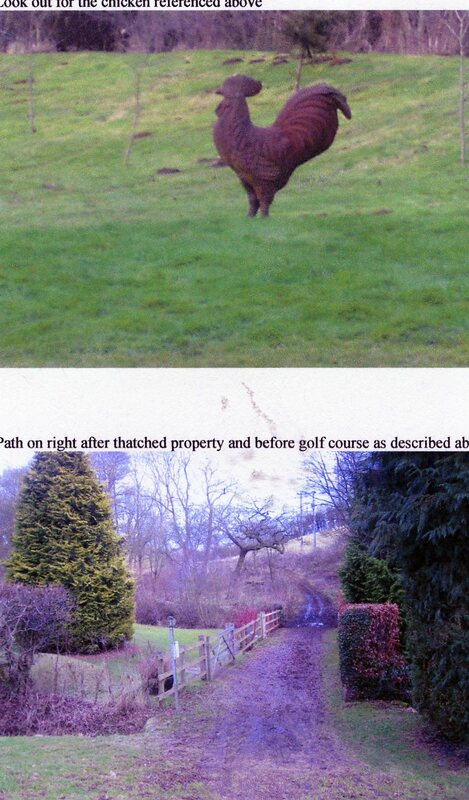 Morning, I will try and find ‘point 7 for you, although probably not in time for your walk. It does follow on quite well so you should not get lost, I hope. Are you a local or just visiting? The Editor. We are coming to stay in Wroxton on 16th May. Can you tell me the distance of these two walks and how long the first one will take. Hi Dan, Sorry for the delay.. I have been checking this out. The longer one is about 9 miles and the second one is about 5… according to folk in this village who have walked them both.